Get ready for a baby shower with these do-it-yourself party ideas. Need some inspiration for a baby shower that you want to host? These ideas can help you design a great party with innovative ideas for invitations, decor, snack ideas, and so much more. Surprise your party guests with some adorable cupcake push pops from Inspired By This. These "punny" cupcake pops are perfect to remind your special momma-to-be about her very special "push" day on the horizon. Pick from a variety of clever label ideas. If the baby gender has been kept a secret up until now, and the mother-to-be is ready to share the news, help reveal the baby's gender to family and friends by making some cute diaper cards by Kristi Murphy. Everyone should open the cards at the same time to collectively discover the baby's gender. A fantastic way to decorate the snack table, find out how to transform an ordinary globe into a chalkboard (an idea by Farm Fresh Therapy). Great for baby showers or pretty much any event, you can customize your message any way you want. The momma-to-be will most certainly appreciate this diaper cake centerpiece that doubles as a gift. The best part is that it takes less time to put together than a regular cake. All you need is diapers, ribbon, and tape to make it. 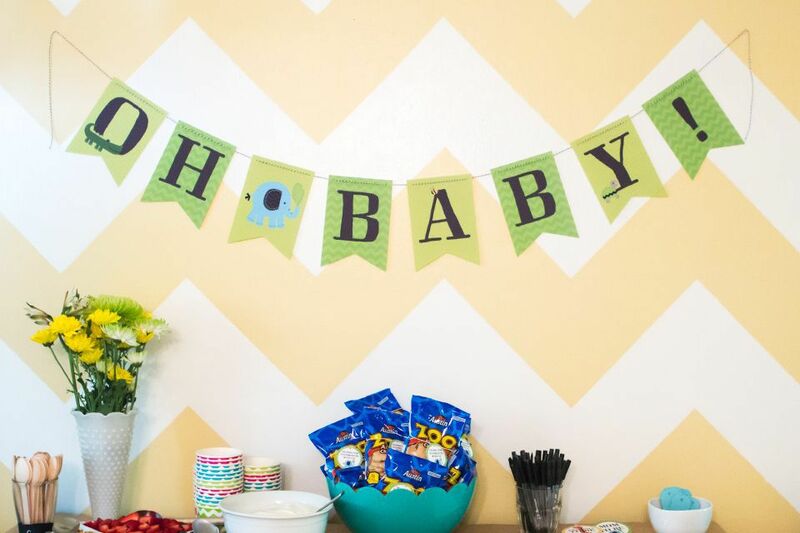 Welcome guests to the baby shower with a baby shower-themed banner. This printable banner is an easy do-it-yourself project from Sarah Hearts. All you need is a printer, paper, scissors, and string. These two jungle-themed banners say "Welcome" and "Oh, Baby." Decorate cardboard boxes to resemble giant baby blocks, which are perfect decor for a baby shower. These blocks double as a perfect background or photo prop. You can place these blocks scattered behind the mom-to-be as she opens her gifts. These will be featured in many photos taken that day. This idea is courtesy of Oh Happy Day. Cut out animal silhouettes in pastel-colored paper and hang them on a string for a cute banner at the party. Invite all the guests to write a message with their wishes for the baby on an animal silhouette. This is a simple baby shower activity for the guests from the Art Bar. Paint plain wooden peg dolls to look like a family of animals with this cute crafting project that can serve perfectly as a cake topper for a woodland animals-themed baby shower. This cake topper from Shrimp Salad Circus gives your party a personal touch. Keep everyone entertained by setting up a onesie painting station inspired by I Love To Create. All the guests can paint a plain white onesie for the baby. Decorate the baby shower you are hosting with some cheerful and fun party decor: take regular white balloons and enhance them with acrylic paints in soft pastels. A complete set of watercolor balloons can be clustered together around the snack and gifts tables. This idea was conceived by Studio DIY. Studio DIY recommends decorating cupcakes for a baby shower by topping them with do-it-yourself pink and blue balloon cupcake toppers made out of cardstock and paper clips. 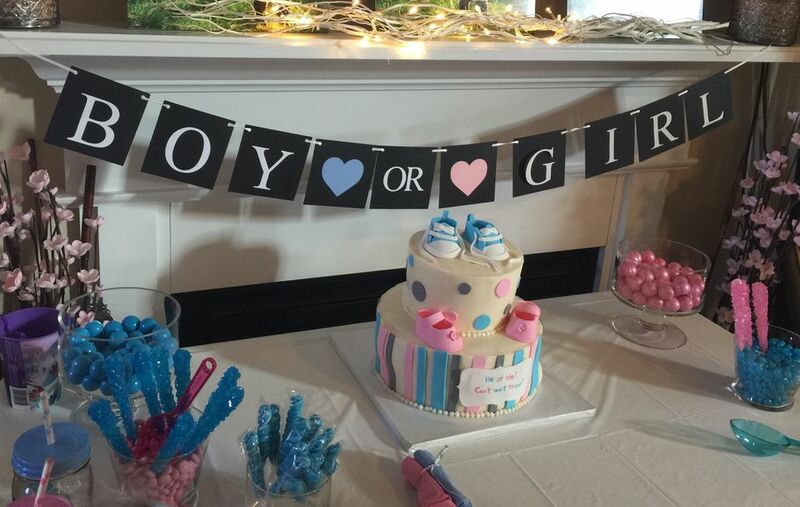 Another fun idea can be to fill the cupcakes with either a pink or blue frosting so when everyone bites into the cupcakes, the baby's gender would be revealed to all the guests at the baby shower. Without question, everyone at the party is going to want to take a photo of the cake and your handmade onesie cake topper, an idea developed by Oh Happy Day. To decorate the cake for the party, hang a mini clothesline made out of straws and string to hang tiny paper onesies as a cake topper. Create candy-filled baby block party favors suggested by Oh Happy Day. Decorate clear boxes with a printable baby block template that you can glue to the exterior of the treat boxes. The completed candy-filled baby blocks can be stacked on tables at the baby shower and double as party decor. Help the mom-to-be remember her baby shower with all her family and friends by making a homemade guest book idea conceived by Aspen Jay. At the party, each guest can write their name on one of the paper balloons. Make any snack you serve at the shower fit the baby shower theme with some onesie snack toothpicks, which you can stick into the tops of any appetizer or cupcakes. ​This idea comes courtesy of Dream Green DIY. Thank everyone who attended the baby shower by sending them home with cute fabric wrapped candles that take only a few minutes to make. This baby shower candle favor tutorial was developed by Alice And Lois. Adorn regular inflated balloons with small butterflies to create some easy but beautiful do-it-yourself decor for the party. Butterfly balloons are an idea from Design Improvised. Invite everyone to the baby shower you are hosting with this creative Oh Happy Day-developed DIY baby shower invitation that fits perfectly inside a small gift box. These handcrafted individual-sized candy bags come courtesy of Kristi Murphy and are sure to be a hit at any baby shower. Perfect for a jungle themed baby shower, these animal cupcake toppers by Sweet Steph Card Creations are simply adorable. You can follow the way they make the animal cutouts or look at how they do it for inspiration and make cutouts of any kind. Decorate the snack table with a DIY baby shower tablecloth suggested by Oh Happy Day. This is labor intensive and will take a few days, but the end result is a table cloth that would have cost you a lot for the cost of a few dollars. To add some adorable baby shower decor, place some of these diaper snails around the snack table. This tutorial comes courtesy of Handmade Charlotte.